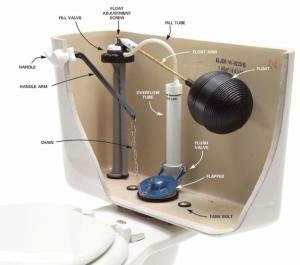 Are you tired of having to watch your toilet’s plumbing for leaking? What about managing your toilet’s ‘sweating’ problems in the summer? And, what if you’re tired of dealing with a toilet that just won’t flush down anything? Minor toilet issues often turn into major repairs if you don’t have those issues addressed in time. Water damage from toilet or plumbing-related flooding or even sewage backing up into your home causes costly damages that no one wants to handle. Call for professional help as soon as you sense something wrong with your toilet and its plumbing. If you notice issues like weak flushing, or your toilet continues to run despite flushing, get in contact with our Knoxville Minor Toilet Repair experts at Knoxville Plumbing, LLC. Minor toilet problems are simple to repair. They can be repaired very quickly and at no inconvenience to the homeowner. Although it might flush, a constantly running toilet will add on to your water bill. This problem is usually resolved by a simple adjustment—we’ll adjust the toilet, so incoming water pressure and level in the tank isn’t too high or too low. That’s what helps remedy overflowing or incomplete flushing. Keeping your toilet clean and free of grime buildup on its surface and flush handle. Keeping foreign objects away from the toilet bowl. Avoiding putting anything inside the toilet tank, such as cleaners and deodorizers. Taking time to listen for any unusual noises that may come from the toilet tank, particularly when flushed. Properly maintaining your toilet will prevent any minor and major issues from happening, causing significantly less problems. We understand that people in Knoxville have all sorts of minor issues with their toilets. So, why keep ignoring those problems? Call Knoxville’s experts in Knoxville Minor Toilet Repair at (865) 622-4866 to get the help you need. We guarantee same day service—or our visit is free. We can perform same-day repairs if you call us before noon on weekdays. Before you call, make sure your toilet’s water supply is shut off, which will prevent any potential flooding and water damage. Also, close off the area and don’t use the bathroom until we can make it in for repair. Have an overflowing toilet that won’t stop? Or, is your toilet refusing to flush properly? If this has happened to you, you might be experiencing a major toilet issue. If you have issues like a constantly overflowing toilet, a toilet that won’t flush or another apparent issue, get in contact with our Knoxville Minor Toilet Repair experts at Knoxville Plumbing, LLC. Sometimes, decidedly minor toilet issues morph into major issues. The most problematic and common minor toilet issue – clogging – is often responsible for causing various major toilet issues. Clogged toilets are undoubtedly most common minor toilet problem. When this happens, it causes the toilet to overflow. In some cases, the clog may move farther down the sewer line and cause water to back up in your tub, toilet and sink drains. Sometimes, a clogged toilet can signify a serious underlying issue, such as severe damage in your sewer line. This particular issue has the potential to turn into a serious health hazard, which also has the potential to cause significant water damage to your home. Thanks to that, it’s important to call your professional Knoxville Minor Toilet Repair company to remove the blockage. There are several things you can do before we arrive to fix your major toilet problem. Make sure your turn off your main water valve, which helps reduce the chance of additional water flow occurring while we fix the issue. Also, move any items that may be damaged by leaking or overflowing water into a safer, drier area of your home. However, the most effective way to prevent major toilet issues is taking time to schedule routine toilet maintenance. We recommend that you get annual toilet inspections to ensure your toilet’s components are operating properly. You should also take some time to examine your toilet for cracks or other damage. We’ll repair any major toilet right the first time—or you don’t have to pay a dime. Call your local experts in Knoxville Major Toilet Repair to get the help you need. We guarantee same day emergency service—or our visit is free. Knoxville Plumbing LLC are your Knoxville Major Toilet Repair experts, providing quality toilet repair solutions.